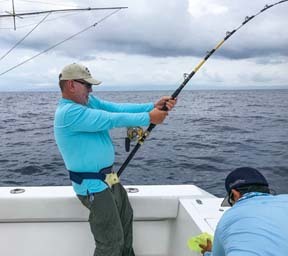 “Shawn and Joe, do you want to stop catching these smaller tuna and dorado and just try for marlin?” the captain asked my friend Joe Bahash and I in Costa Rica. Joe had already caught and released an estimated 180- pound marlin and I think the captain wanted me to catch one too. Either that or he was tired of taking the tuna and dorado off the hook and releasing them. We were trolling around an approximately 20’ long tree floating in the water and the line could not be in the water for more than two minutes without the line screaming and one of us catching a dorado or tuna. Now grant you they were not big….my guess is the average size was 6-12 pounds for both species, but I had never been in such a wide- open bite in my life. 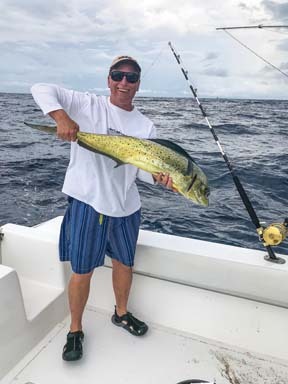 I did manage one dorado in the 20- pound range that we had a quick photo shoot with and then was released. My guess is that in four hours of trolling around that tree in our 35’ Strike w/Tower, Joe and I caught about 70 dorado and tuna combined. The smaller ones were used for bait for the marlin and except for a few that were kept for dinner everything else was carefully released. This was our first full day in Costa Rica and honestly life did not get any better. All the equipment on the boat worked great. They had excellent rods and reels and they were boasting the PENN brand and name. 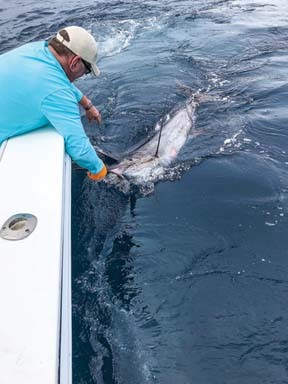 We were catching our small dorado and tuna on little Senator reels, but the marlin was caught on a new PENN International reel. The cool thing (other than wide open fishing) was that while Joe and I were catching fish and having a great time, our non-fishing wives were getting pampered at the spa at Crocodile Bay Resort in Puerto Jimenez, Costa Rica. 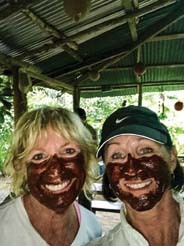 Or maybe they were doing their chocolate farm tour? Or maybe they were taking a guided hike? All the things that people who don’t want to fish can do is why Crocodile Bay has become one of the most popular fishing/eco lodges in the world. They offer nearly 30 tours or alternative choices for non -fishing people. 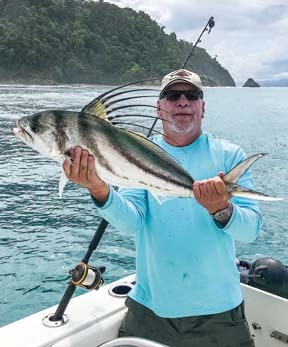 And if you fish you have the choice of going inshore for species like roosterfish or pargo or offshore for marlin, sailfish, dorado and tuna. 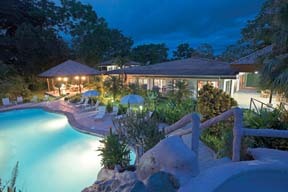 Over the years Crocodile Bay which I last visited 18 years ago when it first opened, has evolved from being strictly a fishing lodge to a world class eco tour and wellness retreat in addition to offering great fishing. It was nice to know after pulling hard on fish all day that there was a massage waiting for me and Joe. The lodge had changed a lot since I had last been there. Where there was once a big hole was now a beautiful pool, Jacuzzi and lounge chairs for those that want to relax in the sun. There are numerous more rooms and the ones we had upstairs overlooking the grounds had rocking chairs on the balcony and was very comfortable and peaceful. 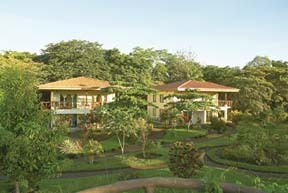 Crocodile Bay Lodge is located on the Osa Peninsula which is the southwestern region of Costa Rica. The peninsula is home to at least half of all species living in Costa Rica. The main town on the peninsula is Puerto Jimenez, which has its own airport and provides access to Corcovado National Park. The airport is a unique place to land as it is right next to a cemetery and is what you could call small. We took a midnight flight from LAX to San Jose, Costa Rica. After landing in San Jose, Costa Rica we then took a smaller plane for a quick 45- minute jaunt to the lodge. The flight to San Jose from LAX was about 6 hours. 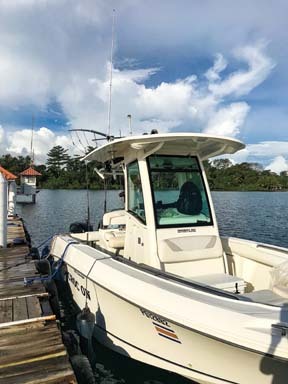 The lodge itself is about a 90 second walk from the water where their fleet of Boston Whaler and Strike boats are kept on their 600- foot pier. I did not fish on the pier, but I was tempted. I was told that there were big pargo down there, but I was so busy doing other things I did not have the time to try it. When we arrived in the afternoon, we were greeted at the lodge by Olympia a lady from Panama with a personality like no one I have ever met. And I mean that in a good way. She is known as the ‘mother’ of the resort. Olympia greeted us with a song and a glass of juice. A splash of rum was added to the juice for those that wanted it. During our stay, Olympia was the go to person we went to with any questions. Not that we had many as they make it very easy there. She also made some great cookies that she gives toanglersas a good luck charm in the morning. They sure worked for me and Joe. The food there was delicious. 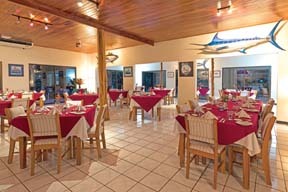 After catching some dorado the first day we brought them back and gave it to the chef. The mahi mahi was grilled in a light teriyaki sauce and it was so good. It is hard to beat fish that fresh. They have a full menu though for those that don’t want the catch of the day. There was pasta, steak, fish, fresh vegetables and scrumptious desserts to choose from. I am pretty sure I went from a pant size of 34 waist to a 36 in my four days there. Of course, Imperial beer, the most popular beer in Costa Rica might have helped with that too. After fishing the first day, on the second day my wife Linda and I went on a guided tour of the National Park with Joe and his wife Donna. We saw scarlet macaws, all kinds of different species of monkeys, iguanas, Jesus lizards (they walk on water), various birds, sloth’s and leafcutter ant colonies like you have never seen before. I won’t bore you here with how structured and amazing these little army ants are, but it is worth your while to learn more about them. After our tour we found a place in town that had great fish tacos. Joe said they made a mean margarita while I discovered a Costa Rican craft beer that was made with blueberries and was really good. The town is only a ten- minute walk from Crocodile Bay Resort but honestly there is not a whole lot to do in Puerto Jimenez. On day three which was our last full day there, Joe and I were booked to go inshore fishing and try for roosterfish. We were on a smaller 25’ Whaler since we were going inshore. It was a beautiful and comfortable boat. The weather looked like it could be nasty as there were many clouds and just had the feeling of rain. Once we got on the water and were out for 10 minutes we could see rain all over the water but for some reason it was leaving us alone. It was all around us like we had a cone over us. Not 30 minutes from the dock at Crocodile Bay Resort we started trolling live bait about 200 yards off the coast for roosterfish. After about a half hour of this with no bites I grabbed a spinning reel with a popper and gave that a try. It took about an hour into our fishing but a roosterfish (the one on the cover) finally got fooled on the troll and I quickly jumped up and went to battle with the 15-20 pound or so roosterfish. When I was here 18 years ago I caught one over 50 pounds and can still remember what a great fight that was. This guy for his size was quite feisty and did not want to come in but after about 5 minutes I got him to the boat. After a couple of photos that Joe should be proud of the rooster was carefully released. Right after that the other reel started screaming and Joe went and got his roosterfish. After he got that in the boat we asked the captain if we could go look for the log again offshore. I was sure it was still holding all those dorado and tuna and probably some marlin too. He said this boat was made more for inshore, but it would not be a problem and we could tell he was a little hesitant but eventually said let’s go find that log. The problem was we were the only boat out fishing so unlike the other day when there were four or five boats out and communicating with each other we had one boat looking for a needle in a haystack or in this case a log in the ocean. Needless to say, all we did was burn fuel the rest of the day. We trolled to no avail, but our captain gave it a greateffort. Since the water was rough with the storms it was probably harder to find the log which could have been 10 miles in either direction. In hindsight we probably should have stayed inshore and caught a few more roosterfish and then tried for pargo, pompano, grouper, snapper and jack which can all be plentiful. While we were searching for fish, the girls went on a tour of a chocolate factory. I heard it poured but they made the most of it and had a great time on this excursion. There were a few other excursions they wanted to do but we did not have the time. Being Joe and I need to go experience the inshore fishing correctly and the girls have other excursions to do, I think a return trip to this jungle paradise just might be in order.